October | 2011 | Welcome to Strathfield's Most Recommended Agents! SYDNEY house prices are tipped to eclipse all other capitals except for Perth over the next three years. Prices in the harbour city will rise 19 per cent – or 8 per cent in real terms – in that time and take Sydney’s median house price from $644,000 now to $770,000 by June 2014, the QBE LMI Housing Outlook 2011-2014 report says. This compares with 20 per cent in Perth, 16 per cent in Brisbane, 8 per cent in Canberra and only 6 per cent in Melbourne. The report, prepared by BIS Shrapnel, says the underlying strength of the Australian economy, stable interest rates in the short term, high immigration and a dire shortage of houses in Sydney, will be the main drivers of this growth. It also predicts that first home buyers will start to re-enter the market in greater numbers next year as the outlook for the economy improves. This will in turn encourage others to return, especially upgraders, as demand for their properties improves. ”Sydney hasn’t fallen in a hole and house price growth has been minimal but has held up over the last 12 months,” said Robert Mellor, the managing director of BIS Shrapnel. At Richard Matthews Real Estate we know that knowledge is power. To help our clients feel empowered in the selling process we provide FREE detailed property reports with key information on the property and it’s location. To take advantage of this valuable service please send an email to our team: admin@richardmatthews.com.au providing your name, property address and contact number. Social media is hot property! In today’s real estate market people are more time poor than ever before, so it’s essential to engage in as many affective advertising channels as possible. Richard Matthews have found social media to be a reliable, growing resource that provides cut-through for their clients listings. Gone are the days where property hunters have to actively search for listings and advice, with the Richard Matthews social media network, this information is now literally at the public’s fingertips. The success of the social media phenomenon was recently lamented with Google’s introduction of iGoogle. Given all the success Richard Matthews has had with social media it’s surprising that many other agencies in Sydney have chosen to ignore this growing medium, thereby disadvantaging their clients. 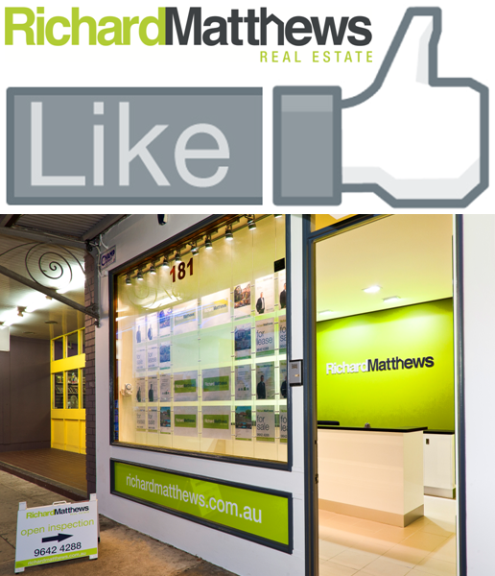 The Richard Matthews social media pages allow their team to share advice and generate property buzz in a timely fashion. One of the very first steps taken in a Richard Matthews marketing campaign is to provide free posts on their Facebook, Twitter and YouTube pages. In a matter of minutes your property can be advertised online for the whole world to see, including thousands of keen property hunters. The main benefit of social media is that it reaches a targeted, highly receptive audience that can also choose to share this information with family and friends, increasing your properties exposure even further.